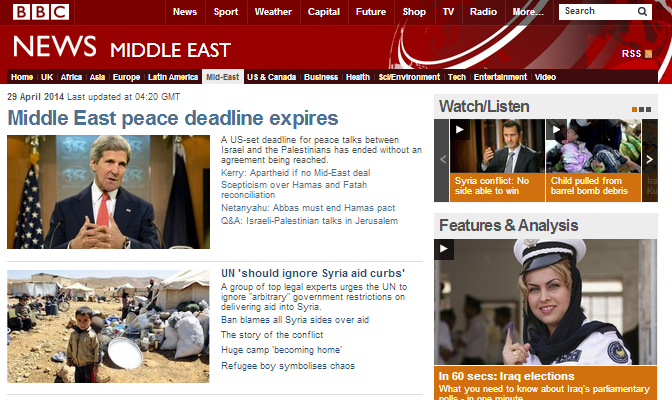 Early on the morning of April 29th the BBC News website’s Middle East page ran a lead item under the headline “Middle East peace deadline expires”. The article – titled “US-set Middle East peace deadline expires” – opens with the egregiously context-free filmed report by Jeremy Bowen previously discussed here and with two hundred and three words of repeated amplification of John Kerry’s recent ‘apartheid’ remark. “A US deadline for peace talks between Israel and the Palestinians has ended without an agreement being reached. Talks resumed in July after a three-year hiatus but made little progress. “Talks between the two sides were already troubled after repeated disagreements over settlement building and the release of prisoners. So as we see, in addition to stressing that the talks were “halted by Israel” (less than a week before their pre-set expiry date), the BBC notes two factors which it claims caused the negotiations to be “already troubled” – both of which are related to Israel – but fails to clarify to audiences that Israeli building tenders were not one of the issues included in the run-up agreement to the talks. Notably, the BBC makes no reference whatsoever to any ‘trouble’ or difficulties afflicting the negotiations caused by the actions of the Palestinian side. No mention is made of the PA’s continued incitement and glorification of terrorism throughout the nine-month period of negotiations. Audiences are not reminded that the PA applied to join assorted UN bodies in early April in direct contravention of the agreement which preceded this round of talks or that the prisoner releases scheduled under the same agreement were linked to progress in the talks. Neither are they informed of the PA’s repeated refusal to recognize Israel as the Jewish state or its Arab League backed refusal to come to viable agreements regarding security arrangements in the Jordan Rift Valley. And of course in this report – as in all its ample coverage of the Hamas-Fatah reconciliation deal – the BBC makes no attempt to explain to audiences that the PLO and PA knew well in advance exactly what the effects of such a deal would be on the negotiations, but chose to go ahead with it anyway. Significantly, the points the BBC intends audiences to take away with them on the subject of the reasons for the end of this latest round of negotiations are exclusively related to Israeli actions: Israel “halted” and “suspended” the talks which were already on the rocks because of Israeli “settlement building” and the eventual Israeli decision not to release the final tranche of prisoners – although the BBC ‘forgets’ to note that this was after the PA made its applications to the UN. The Palestinian Authority and the PLO on the other hand – according to this BBC version of events – have been completely passive throughout the entire nine months, doing nothing whatsoever to cause the talks to become “troubled” and with the only active move on their part worthy of report being the forging of a cuddly unity deal with their Hamas brethren right at the end of the nine months. Of course anyone who has been closely following the BBC’s reporting of these negotiations throughout the entire nine months would not expect any other framing of the story.